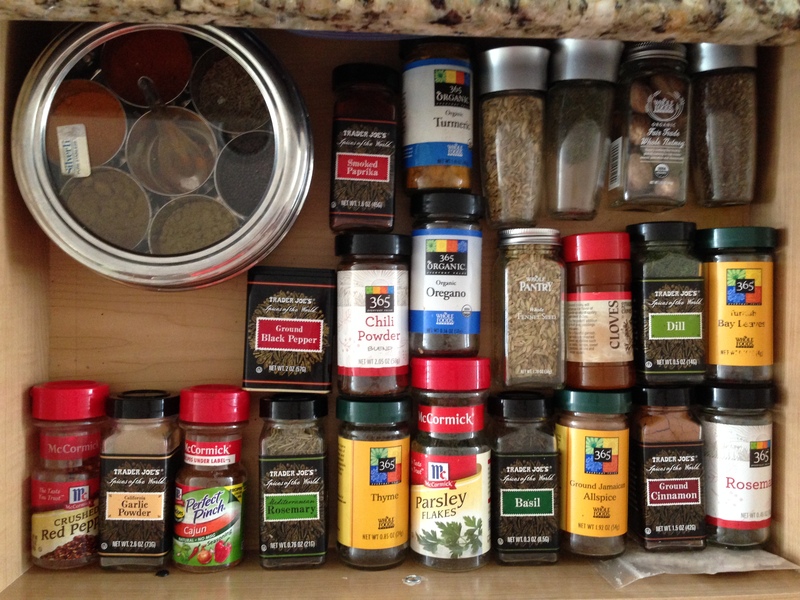 Arial view of my spice drawer. Way more convenient than storing these in a pantry, btw. Lately it seems several friends, family members, and clients keep telling me the same thing: I want to experiment with new foods, but I have no idea WHAT GOES TOGETHER. I’m ok when I have a recipe that I can follow, but if I find myself in the store without that guidance, I’m at a loss for what to buy. I used to be the same way. When I first got into cooking, I was slave to the recipe, following everything to a T, afraid of deviating in the slightest way, lest I screw something up. Gradually, I started taking a little creative license. I still used recipes as a starting point but would swap one ingredient for another here, one cooking method for another there. Now I’ve progressed to the point where I feel confident enough to create recipes on my own. Today I’m sharing some of my “Go-To” flavor and ingredient combinations. The lists are by no means exhaustive, but they provide a good starting point, and all of the items complement each other pretty well. I’ve arranged them in what I like to call “Chipotle style,” where you pick your carbohydrate base, add the veggies you want, heft it up with your protein(s) and healthy fat(s) of choice, then flavor as you prefer. The nice thing about organizing items this way is the flexibility it affords. Feel free to omit categories as you like (maybe you’re watching your carb intake and want to skip this one, for instance), and choose as many or as few items from each category as suits you. And if it STILL seems overwhelming, pick just one ingredient and go from there. I do this all the time. Have some avocados in your refrigerator that need to go? Avocados always get me thinking Mexican, so pick up some black beans, tomatoes, onions, corn, bell peppers, lime, and cilantro. Dice the veggies, chop the cilantro, and toss everything together in a bowl. Stir in the lime, maybe a bit of olive oil, and salt and voila! You have a fresh salad for lunch, with plenty of leftovers for tomorrow. Looking for a heartier main dish? How about combining all of the Mexican “flavors” below with some salt and olive oil and using it as a beef marinade? You could then simply top the meat with sliced avocado or make a guacamole. The “start with one ingredient” strategy works equally well if you find yourself hankering for something (“Gosh I am REALLY in the mood for some eggplant tonight, but what should I make?”) or want to experiment with a new ingredient (“How do you cook tofu anyway?”). In the latter case, remember google is your friend. And don’t be afraid to mess up. If you destroy the tofu, you can always omit it from the dish. Or feed it to the dog. Assuming dogs can eat tofu. I don’t have a dog, so I’m really not sure. But you get the picture. Oh and everything on the lists fits my definition of healthy. I almost always opt for whole grains over refined ones, so you’ll see brown rice on the list but not white rice. Fat is critical for good health, but not all fats are created equal. My lists include those that I use and consider healthy. I’m also not a vegetarian, so animal proteins make the cut. I simply suggest that you opt for lean varieties. Speaking of protein, look closely, and you’ll see that every list has the same protein choices. This simply reflects my belief that proteins go with just about anything. So go on! Step outside your culinary box, and unchain yourself from the recipe!